At the national level, schools are indeed complying. At the state level, there seems to be some states still well below the desired 85%. These are Delaware, Georgia and Kentucky. And there is an obvious odd one, the state of Maryland. With a substantial fraction of students in Maryland being excluded from the NAEP, it is important to correct its scores on the NAEP. 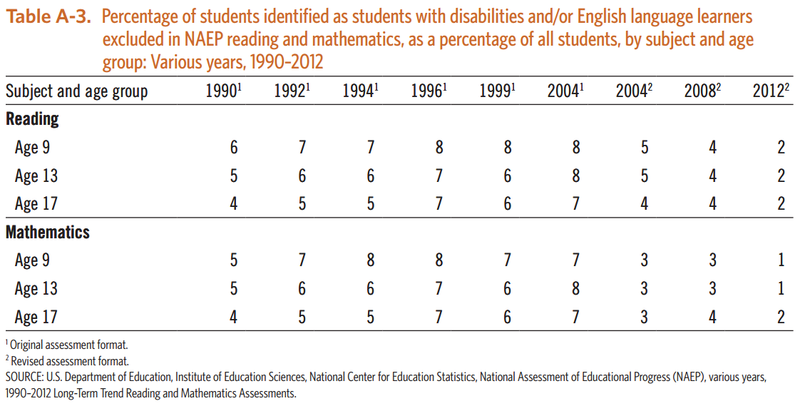 The NAEP has estimated that the "real" score of Maryland, if only the state had complied with the policy of inclusion, is about 10 points lower. As a result, instead of being ranked as number 2 in Grade 4 reading for the entire country, the state drops to number 12. Is this gaming? A high ranking in the above table perhaps does not bring more dollars to the schools in Maryland, but it does bring prestige. It probably makes parents in Maryland feel comfortable and proud with their schools. It is misinformation. It sends the wrong assessment to the public. An assessment is supposed to show weakness as well as strength. An assessment is a guide. Incorrectly administering a test serves no purpose when the results do not really resemble reality.